Eagles’ Jake Elliott kicks a field goal with holder Donnie Jones against the Los Angeles Chargers. Caleb Sturgis is eligible to come off injured reserve, but it doesn't sound like the Eagles are going to make a change. 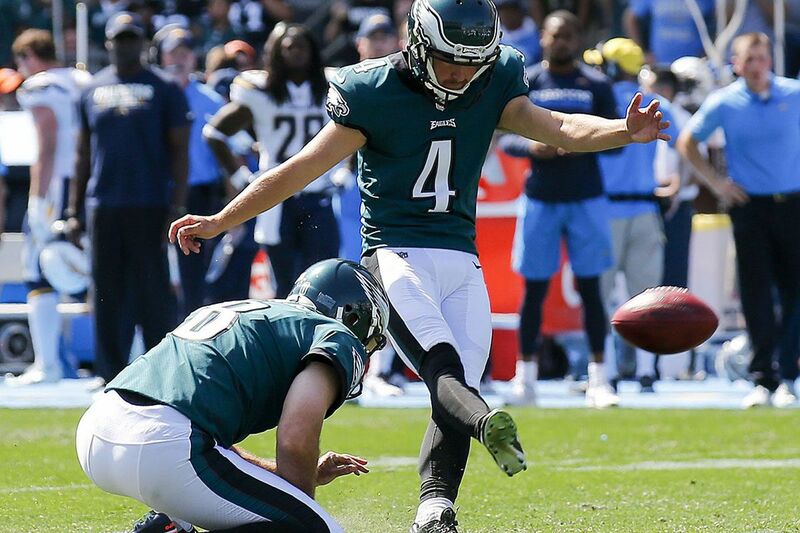 Jake Elliott is having a historic season and it appears to have won him the job if he continues kicking as he has. "I would say right now there's no reason to make a change," special teams coordinator Dave Fipp said. "But at the end of the day, Jake's still got to improve, too. We've got to improve as a group in our operation. But right now, I'm definitely not looking to make a change. But at the end of the day, it's a performance-based business. We all know that." Elliott set the franchise record for field goals of 50-plus yards in a season. He has connected on 17 of 20 field goals, although he missed three extra points in the last two games. The misses haven't necessarily been his fault. Coach Doug Pederson said Monday the Eagles haven't made any decisions about Sturgis. This is a tough spot for Sturgis, who was one of the NFL's top kickers last season. His 35 field goals last year were the most in Eagles history and ranked second in the NFL. He connected on 85.4 percent of his field goals and appeared on his way to finding a steady home before a Week 1 hip injury. Fipp's message to Sturgis is to focus on getting healthy and not rush. Sturgis' contract expires at the end of the season, so he needs to be healthy for wherever he's kicking next season — whether it's in Philadelphia or elsewhere. And if something were to happen to Elliott this year, Sturgis would be in the building able to come off injured reserve. "At some point if we need another kicker here, he could fill that role," Fipp said. "But right now, the message is get healthy, get ready to go, and see where we go from there." If any kicker could understand the situation the Eagles are in, it's probably Sturgis. This is how he won the job in the first place. Cody Parkey was coming off a Pro Bowl season in 2015, suffered an injury, and Sturgis took over. He then beat out Parkey for the kicking job the following summer and found a home here. It's the life of a kicker. There are only 32 of these jobs and they come with little security. "I think they all know that could happen or that's possible," Fipp said. "What is it, the Wally Pipp deal in baseball? Any time they get hurt, they know someone else is going to get in there and do their job, probably ultimately know if a guy does a great job he'll get a chance to keep his job." If your friends haven't subscribed to Early Birds, it's free to sign up here to receive the newsletter in your inbox every weekday. I want to know what you think, what we should add, and what you want to read, so send me feedback by email or on Twitter @ZBerm. Thank you for reading. After the Jay Ajayi trade, running backs coach Duce Staley has a lot to handle with his group. Paul Domowitch tells you why he can. Doug Pederson had a lot of critics before the season. What do they think now? Find out from Rob Tornoe. Jeff McLane and I talked Eagles at the bye in the latest Birds' Eye View podcast. If you missed Wednesday's newsletter, there's insight on Halapoulivaati Vaitai's improvement. How has the safety play been this year? Is it covering up deficiencies on the outside or are both units just better than expected? The safety play has been exceedingly strong this year — Malcolm Jenkins and Rodney McLeod form one of the best combinations in the NFL. Jenkins is being used differently than last season, playing closer to the box and not playing the slot. When he's in coverage, it's often against tight ends unless there's a specific matchup the Eagles want. And McLeod continues to make plays, swarming around the ball and playing deep coverage. I don't know if I'd phrase it as the safeties making up for the deficiencies on the outside, but I think their experience and versatility take some of the pressure off the outside cornerbacks. They know how to align the back end and they're both reliable tacklers. It's a strength of the Eagles defense.